If the mark of a special player is to make the extraordinary look routine, then Kasper Schmeichel is building a compelling case to be seen as the equal of any of his goalkeeping colleagues. The greatest goalkeepers win matches and the man whose penalty save against Sevilla ensured that Leicester City are the last English team left in the Champions League came to their rescue again by frustrating West Ham United with some wondrous late defiance. Minutes away from recording their first away win in the Premier League in 342 days, cracks were starting to appear in Leicester’s stout resistance. For all that they have rediscovered their champion swagger at home, their revival under Craig Shakespeare had not been tested away from the King Power Stadium. In the end, after a frenzied late assault from West Ham, they passed this test. That they did so owed much to Schmeichel’s latest heroics. The Dane was engaged in a personal duel with Andy Carroll by the end and it was difficult to know which of his two saves from the West Ham forward was better. The first came from a low header that seemed destined for the bottom left corner until Schmeichel clawed it away. From the stands, it looked a certain goal. For pure drama and timing, however, perhaps the second stop was superior. With West Ham hammering away in search of an equaliser in stoppage time, only Schmeichel stood in their way. “He’s in the best form I’ve seen him in,” Shakespeare said after Leicester crawled six points clear of the bottom three. The champions had come agonisingly close to blowing their 100% record under Shakespeare. Scoring three goals for the third Premier League game running gave them a solid platform, though, and West Ham paid for a dismal first half. Slaven Bilic’s side are winless in five matches. Leicester’s response to the heavy criticism they endured after sacking Claudio Ranieri has been a reminder that the best teams do their talking on the pitch. Their faultless start to life under Shakespeare has silenced all those jibes about a dressing room full of treacherous snakes and the Foxes arrived in east London having demonstrated how fantastic they can be during that gutsy midweek victory over Sevilla. “We’re going to Madrid,” the Leicester fans chanted, giddily looking forward to next month’s Champions League quarter-final against Atlético Madrid, and it was not long before they had further cause for celebration after punishing West Ham’s muddled defending with three cheap goals inside the opening 39 minutes. Riyad Mahrez’s goal in the fifth minute was a case in point. The danger looked minimal when he swung a cross into the middle from the right, only for it to drift past Darren Randolph. West Ham’s goalkeeper was picking the ball out of his net again two minutes later. Mahrez rolled a free-kick to Marc Albrighton, who crossed for the unmarked Robert Huth to head past Randolph. This was a rare occasion when West Ham’s starting 11 contained a proper right-back. Cheikhou Kouyaté has filled in there in recent weeks, but Mark Noble’s injury forced Bilic to move the Senegalese into his favoured midfield role and start Sam Byram. Yet Kouyaté soon found himself trotting back into central defence when Winston Reid went down with a hamstring injury. On came Robert Snodgrass and West Ham hauled themselves back into the game when Manuel Lanzini delicately feathered a free-kick past Schmeichel, only for Jamie Vardy to pounce on further awful defending from Mahrez’s corner shortly before half-time. 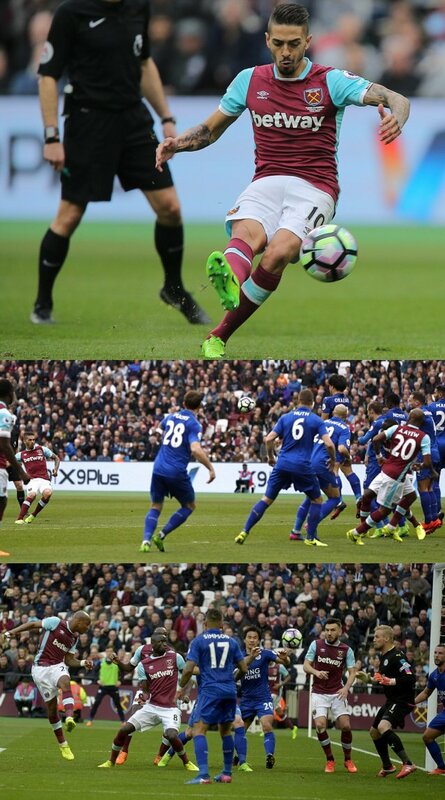 West Ham grabbed another lifeline early in the second half, Carroll heading a corner back into the middle and André Ayew nodding home, and Leicester had to dig deep. Wes Morgan’s back injury meant that Yohan Benalouane was starting his first league game this season and Carroll towered over the centre-back at the far post with 17 minutes left. Schmeichel was there, but Leicester were wobbling. Ayew spurned a wonderful opportunity and Kouyaté had a shot scrambled off the line, but an equaliser looked inevitable when Snodgrass’s free-kick squirmed through to Carroll. Yet Schmeichel spread himself so wide that he looked like he was about to smother Carroll with a bear hug. When the final whistle blew, he raised those two mighty fists high in the air.